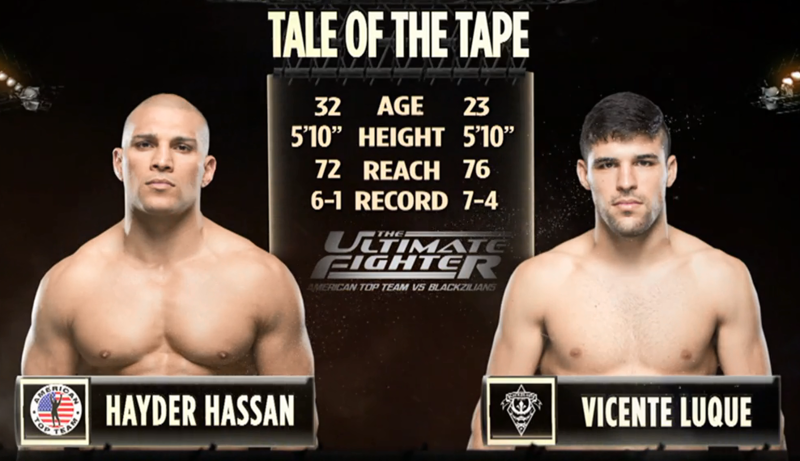 Hayder Hassan vs Vicente Luque The Ultimate Fighter 21: American Top Team vs Blackzilians Jul 8, 2015 (19:05) Hayder Hassan vs Vicente Luque from episode twelve of The Ultimate Fighter 21: American Top Team vs Blackzilians from 2015. 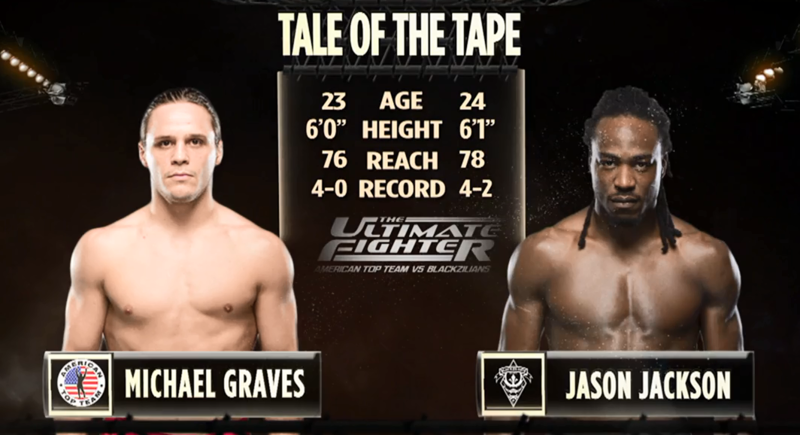 Michael Graves vs Jason Jackson The Ultimate Fighter 21: American Top Team vs Blackzilians Jul 1, 2015 (6:05) Michael Graves vs Jason Jackson from episode eleven of The Ultimate Fighter 21: American Top Team vs Blackzilians from 2015. 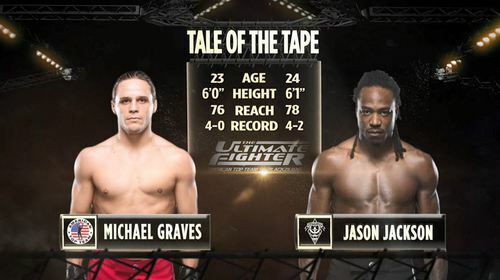 Michael Graves vs Jason Jackson The Ultimate Fighter 21: American Top Team vs Blackzilians Jul 21, 2015 (6:05) Michael Graves vs Jason Jackson from episode eleven of The Ultimate Fighter 21: American Top Team vs Blackzilians from 2015. 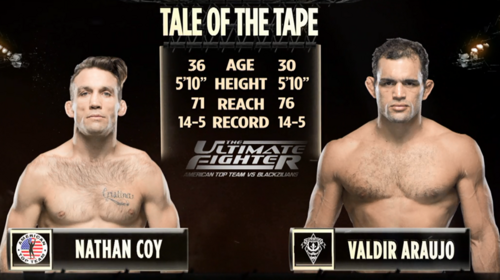 Nathan Coy vs Valdir Araujo The Ultimate Fighter 21: American Top Team vs Blackzilians Jun 24, 2015 (14:12) Nathan Coy vs Valdir Araujo from episode ten of The Ultimate Fighter 21: American Top Team vs Blackzilians from 2015. 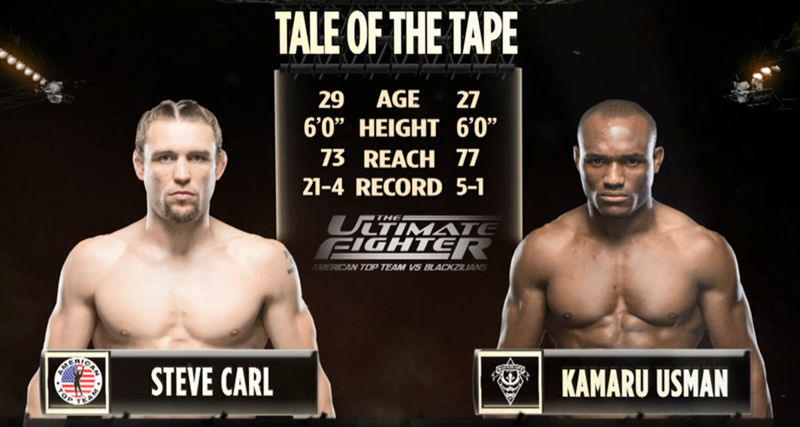 Kamaru Usman vs Steve Carl The Ultimate Fighter 21: American Top Team vs Blackzilians Jun 17, 2015 (13:46) Kamaru Usman vs Steve Carl from episode nine of The Ultimate Fighter 21: American Top Team vs Blackzilians from 2015. 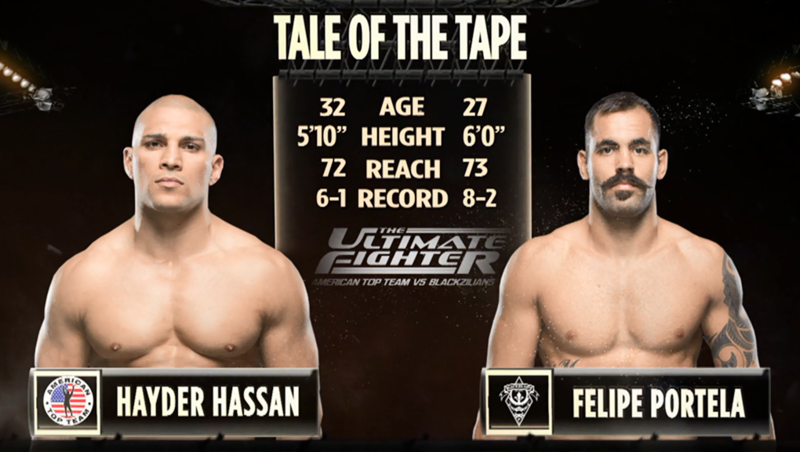 Hayder Hassan vs Felipe Portela The Ultimate Fighter 21: American Top Team vs Blackzilians Jun 10, 2015 (14:29) Hayder Hassan vs Felipe Portela from episode eight of The Ultimate Fighter 21: American Top Team vs Blackzilians from 2015. 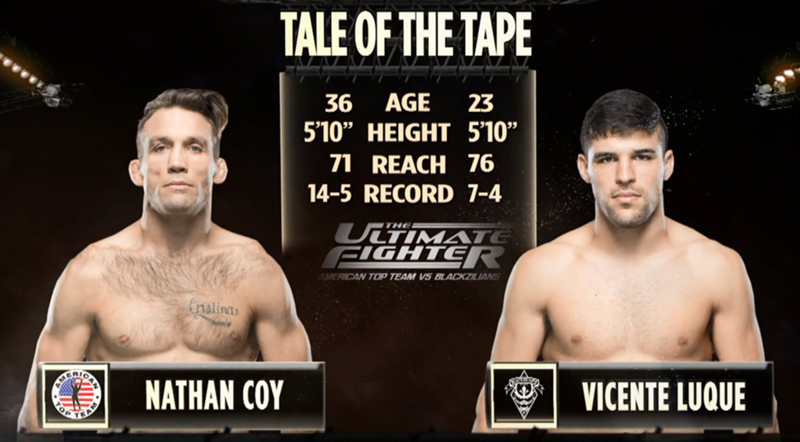 Vincente Luque vs Nathan Coy The Ultimate Fighter 21: American Top Team vs Blackzilians Jun 3, 2015 (13:55) Vincente Luque vs Nathan Coy from episode seven of The Ultimate Fighter 21: American Top Team vs Blackzilians from 2015. 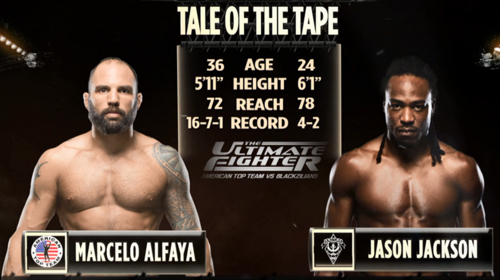 Jason Jackson vs Marcelo Alfaya The Ultimate Fighter 21: American Top Team vs Blackzilians May 27, 2015 (13:55) Jason Jackson vs Marcelo Alfaya from episode six of The Ultimate Fighter 21: American Top Team vs Blackzilians from 2015. 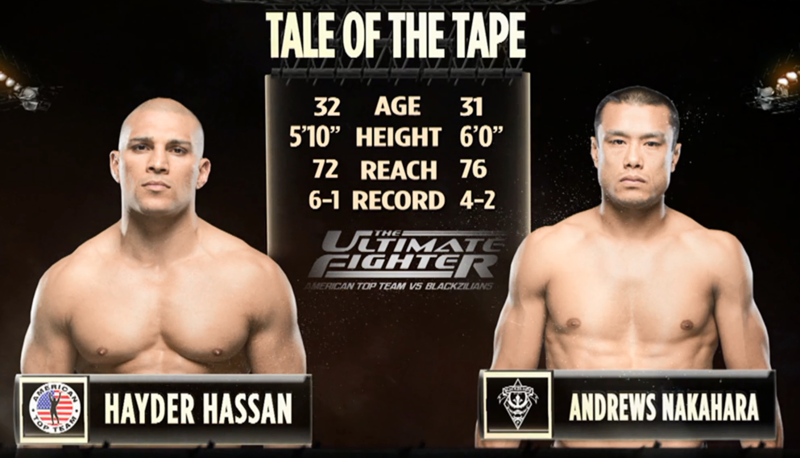 Hayder Hassan vs Andrew Nakahara The Ultimate Fighter 21: American Top Team vs Blackzilians May 20, 2015 (5:33) Hayder Hassan vs Andrew Nakahara from episode five of The Ultimate Fighter 21: American Top Team vs Blackzilians from 2015. 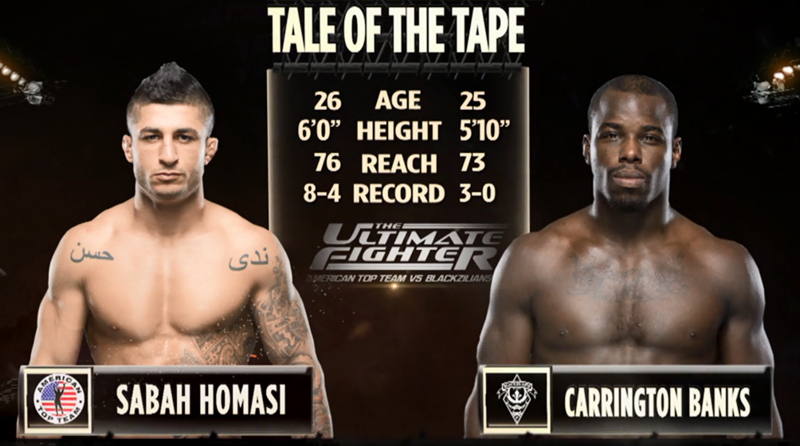 Carrington Banks vs Sabah Homasi TUF 21: American Top Team vs Blackzilians May 13, 2015 (18:58) Carrington Banks vs Sabah Homasi from episode four of The Ultimate Fighter 21: American Top Team vs Blackzilians from 2015. 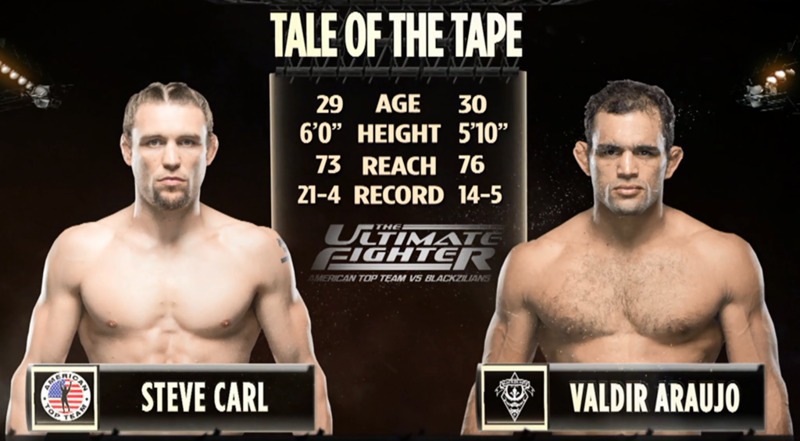 Valdir Araujo vs Steve Carl The Ultimate Fighter 21: American Top Team vs Blackzilians May 6, 2015 (12:41) Valdir Araujo vs Steve Carl from episode three of The Ultimate Fighter 21: American Top Team vs Blackzilians from 2015. Luiz Firmino vs Uros Jurisic The Ultimate Fighter 21: American Top Team vs Blackzilians Apr 29, 2015 (13:07) Luiz Firmino vs Uros Jurisic from episode two of The Ultimate Fighter 21: American Top Team vs Blackzilians from 2015. 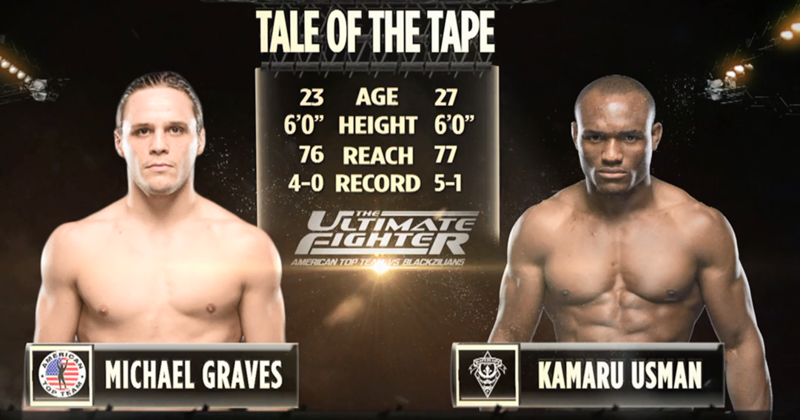 Kamaru Usman vs Michael Graves The Ultimate Fighter 21: American Top Team vs Blackzilians Apr 22, 2015 (13:59) Kamaru Usman vs Michael Graves from episode one of The Ultimate Fighter 21: American Top Team vs Blackzilians from 2015.